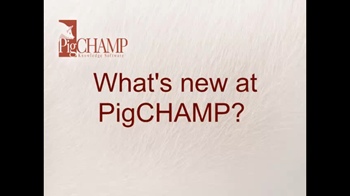 PigCHAMP is continually improving our products and adding new features designed to improve efficiency and save time and money for our customers. Come see us at World Pork Expo, VIB #577, to find out more about these new features, or contact us for more information. Packer Data Import and Feed Mill Import: you asked for it, and we listened. Users can now quickly and easily import data into their Grow-Finish software. Piglet Genetic Link feature: piglets can be assigned an identity at farrowing or weaning. If that piglet is then retained as a gilt or boar, PigCHAMP will automatically create a link. This is useful for genetic multiplier herds and for sharing data with your genetic supplier. Topigs Norsvin Interface: easily export PigCHAMP data and upload to the InGene software program. Productivity Analysis Report: provides a breakdown of the non-productive days for all of the females in the herd, thereby allowing you to analyze the strengths and weaknesses in production. The report also includes the average length of the non-productive categories. PigCHAMP.com has undergone a facelift, and the new site was launched on May 1. When you visit our site, you'll find access to all the familiar features including Benchmarking information, online support, information about products and services, and more. Visit our website, pigchamp.com/benchmarking, to view summaries of Benchmarking data for 2014. And in the coming weeks, watch your mailbox for the 2015 edition of Benchmark Magazine, which will feature a 10-year Benchmarking Overview by Dr. John Mabry.